San Francisco playwright Christopher Chen doesn’t mind narrating his audience members’ experience of his play while they’re watching his play. That’s part of the fun. 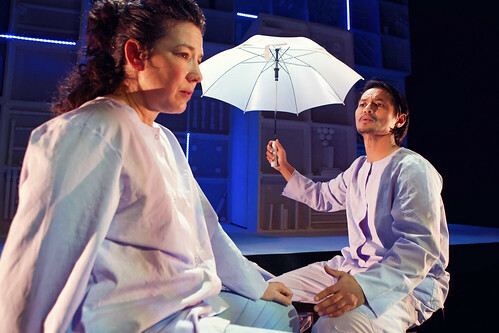 It’s also a tip of the fabulist’s hat to Italian novelist Italo Calvino the inspiration for Chen’s experiment with theatrical form and function in the world premiere of his The Late Wedding. We’ve been here before, more or less. Chen is once again working with Crowded Fire Theater, the company behind his award-winning 2012 hit The Hundred Flowers Project (read my review here). Crowded Fire Artistic Director Marissa Wolf is at the helm of this intentionally bumpy ride, attempting to guide her audience through another Chen work that is as smart as it is funny and as challenging as it is intriguing. Comparisons to Hundred Flowers are inevitable (the new play was actually written during tech rehearsals of that play), and the two works definitely seem of a piece. Chen establishes a pattern early on that involves sly humor and unconventional storytelling, and just when the audience is settling into that pattern, he upends it and takes the play someplace entirely different and more serious. Late Wedding actually begins before it begins. Actor Kathryn Zdan comes out to welcome the audience at the Thick House, and while she’s making cell phone and emergency exit reminders, she’s actually commencing the instructions to the audience. She tells us – in the second person, no less, which she says should set off a full red alert – that if we trust this unconventional theatrical experience, and if we’re really rooting for it to seduce us, we should surrender to her anthropological tour of fictional tribes and their wedding customs. Now, if you’re going to play fast and loose with theatrical expectations, you can do no better than having Zdan be the initial guide. She’s warm, she’s funny and she oozes intelligence. It turns out that each of the six cast members will take over as the tweed-coated anthropologist/playwright during the nearly 90-minute show, though how and when they do it becomes (predictably) hard to predict. At first, the tour is pretty straightforward. For example, we look in on the Bakaan Tribe as two married men (married to each other) practice their tribal duty of remembrance because, as we’re told, they “forever live in memory.” Michael Anthony Torres and Lawrence Radecker are setting memories and get caught up in the fuzziness of the great nectarine/peach debate. 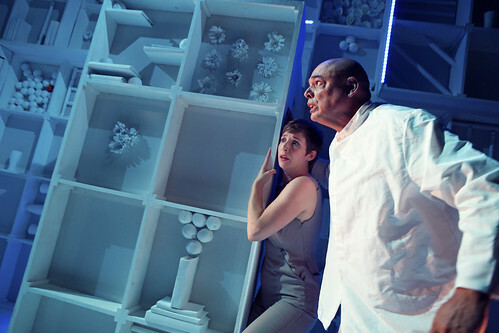 The whitewashed set, comprising boxes filled with whitewashed artifacts (elegant set design by Melpomene Katakalos)Next stop is the Glynn Tribe, where two women, Zdan and Lauren Spencer, are celebrating their wedding, as custom dictates, with separate honeymoons. This idea of separation and prolonging the ecstasy of love’s first blush is taken to wild extremes, and it’s in this beautifully acted scene, that the sketch nature of the play deepens into something honest and emotional. Another tribal couple, part of something known as the “tribe of death,” believes that we are all actually dead, so their marriages have no limits. This is a pretty dubious belief, and even the couple (Michele Leavy and Ogie Zulueta) seem to be having a hard time getting their stories straight. The anthropological tour goes off the rails and onto the rails of a train station when our guide informs us that the playwright was actually working on many other things (including lists of chores involving Netflix and Trader Joe’s), so everything is up for grabs. A spy play bumps into a space epic, which includes a play within the play that, for the space travelers (and mercifully not for us), goes on for several years. Motifs return and dangling threads are somewhat woven into the narrative, but I have to say the last third of The Late Wedding lost me, and the cumulative impact of the experimentation didn’t result in anything more than enjoyment (which is certainly a worthy accomplishment). The play, for all its fragmentation and narrative jolts, still feels like it’s heading somewhere, and that the underlying emotional narrative about marriage and connection and loss will come through all the exposed and splintered theatricality in an even more powerful way. Though there are hints of that power, this Wedding remains elusive. Christopher Chen’s The Late Wedding continues through Oct. 11 in a Crowded Fire Theater production at Thick House, 1695 18th St., San Francisco. Tickets are $15-$35. Call 415-746-9238 or visit www.crowdedfire.org.